You asked me, "Be my partner for life, will you?" I said, "I will, I shall, I do"
I never thought that I would be brave enough to try crossing this bridge once again. 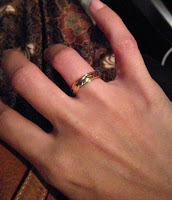 I never thought the man I met barely three months ago will be the very person who would put a ring on me yesterday. I once told myself, "I will not choose another doctor as my life partner because two busy people will break a relationship", but I guess I had gone against my words now. Perhaps because I crave for someone to genuinely appreciate my time just as I appreciate his. My job requires so much sacrifices, time isn't a luxury that I can afford. The very few hours I have to myself everyday are so precious that when I choose to share it with someone, it is only logical to hope that it would not be put to waste. Between him and I, it wasn't a smooth start. To begin with, he approached me barely a few weeks after my last break up. And he is neither a person who is good with words nor expressing his feelings. Mentally, I was not prepared for a relationship, but a part of me needed someone I can look forward to see during my off days. It was such a rocky start, I actually disappeared for almost three weeks when I thought him and I would be like fire and gasoline, but subtly he became the very carbon dioxide when I need him to. Eventually, his voice became the antidote to my constantly buzzing mind. And him asking to meet my parents earlier this month to ask for permission to properly make me his partner - it hit me - he is serious and sincere. After meeting them, he said, "Let's make this work, sayang. Be my partner for life will you?". And I teared down. It was a mixture of feelings. Guilty from throwing tantrums repeatedly. Relieved that Umi and Ayah bless our relationship. Touched from his affectionate gestures. He is not perfect. Neither am I, but we'll do this together. I forgot how it is to be hopeful. I am a fighter who would fight fiercely for anything I believe in or want. At the end of the day, I would remind myself that everything else would be gone and I would have to learn and stand on my own two feet. So I started doing that some time ago. Still a fighter needs teammates, on whom she can rely on when there's the need for any sort of support. As a lone soul, the ability to be hopeful quickly dissipates. And most importantly, my teammate doesn't think similarly as I do. That for him I would do anything but it apparently isn't a two way thing. And I sense myself losing my hopefulness. And that is as bad as being a fighter who lost her weapons and shields. She is now a fighter who enters battlefield knowing the chance of failing and dying ingloriously is high, but that's what she wanted. An end to a hopeless fight. "GET OVER IT! ", they said to me sternly. If it is only that easy, I wouldn't have been hurting myself and those close to me like I am today. The memories of my darker days are vivid, still. I am actually impressed by how well my brain is able to recall petty things instead of those which matter more. I would like to tell the ghosts, that I am better off without them, but who am I trying to lie but to myself? I am equally miserable with or without them. I seem to get unnecessarily insecure. The exact character I despise and the irony is I am that exact person. The slightest form of emotional betrayal, I instantly cower and flee into my safe bubble. They said people who love hot shower are those who are socially deprived and inadequate. They said people who sleeps in foetal position are those who are afraid of being alone. Yes, I sleep in foetal position. I love hot shower. Body language speaks most of your mind. When I finally learned to open myself up to my own best friend, crushed my walls down unconsciously, the fear of feeling vulnerable creeps onto me slowly. Just a single mistake was all it took to change me permanently. I fiercely protect my territory, my sanity, my sanctuary... only to have it all backfiring me. I read articles and I know how bad I am unconsciously abusing and mistreating myself and yet... I can't control myself. Not anymore. Perhaps the mistake I made six years ago has me permanently handicapped. A trainwreck with trust issue so major it is beyond salvation. Perhaps the mistake I made six years ago discounted me from being worthy of being loved. That love is for me to give but not to receive. When I have this thought, I feel better and at ease. For I have lost hope. And with hope comes disappointment. I let go of hope to keep my heart beating. To keep my brain running. Such frustration, is this my toll to pay? But why am I still feeling the same sadness? From which I beg to be free. Nur Zahirah Abdul Rahim . 23rd August 1988 . Not your everyday dentist . All-rounder wannabe .